SUFFRAGE CAUSE PROMOTED AT MILWAUKIE MEETING. Dr. Esther Pohl-Lovejoy Declares English Militant Tactics Will Not Be Fruitful, However. MILWAUKIE, Or., Aug. 17. – (Special.) – “If a suffragette in England throws a brick at the prime minister the fact is flashed all over the world, and the cause of equal suffrage gets world-wide attention, while the finest speech would get about five lines in the papers,” said Dr. Esther Pohl-Lovejoy in her address this afternoon at the rally held in the Milwaukie Grange Hall. She said that the same militant methods would not be approved in Oregon, but were effective in England. Dr. Lovejoy pointed out that Oregon is the only state bordering on the Pacific Coast which has not granted equal suffrage, but that now is the time for this state to take a stand with Washington and California, and even with China. She pointed out wherein women are interested in civic affairs in that they pay taxes, street improvements and own homes. Dr. Samuel M. Johnson, of Portland, spoke briefly in behalf of equal suffrage, and declared that November next he would vote to give the ballot to women for their own protection and for the protection of the home. George C. Brownell said that he had always favored giving women the ballot, and had introduced the resolution in the Senate to provide a vote on the subject. He pointed to the conditions of children who work in factories and the immorality in New York and in other states, which, he declared need the vote of the mothers of the land of change. Mr. Brownell advised that the women organize in every precinct in the state. Captain J.P. Shaw, lecturer of the Grange presided, and the rally was held under the joint auspices of the Milwaukie-Oak Grove Equal Suffrage League and Milwaukie Grange. 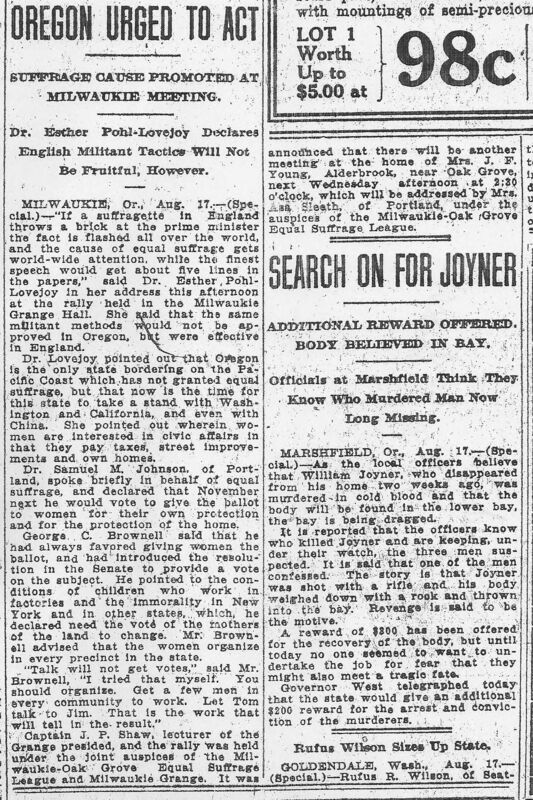 It was announced that there will be another meeting at the home of Mrs. J. F. Young, Alderbrook, near Oak Grove, next Wednesday afternoon at 2:30 o’clock, which will be addressed by Mrs. Asa Sleath, of Portland, under the auspices of the Milwaukie-Oak Grove Equal Suffrage League.